Great shot with great treatment Craig. Now that's a close up. I like your treatment. SO PERFECT!!!!! Makes me smile! Fantastic gathering of their gently bent heads.. The scratch and plaintive viole anticipating orchestration. Outstanding work ! A beautiful image, Craig - the word 'alien' came to my mind too as soon as I looked at it. It looks like something from an old b-movie to me...fascinating. Very interesting image. The processing enhancing the composition and makes one beatiful photograph. Excellent! Spring is finaly here. Take care. 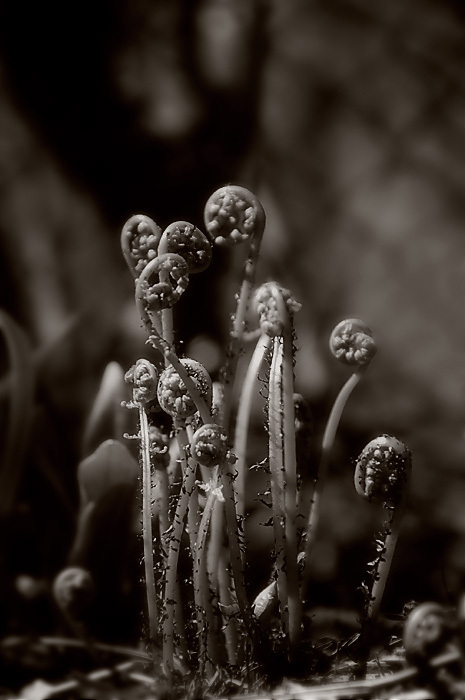 Our thirst to see you back will grow as fast as these ferns. What petem said. Very alien. And your focal level/depth is out of this world. Excellent work here! Be safe! and Blessed! Excellent detail, excellent light Craig! wow, great ,love the tone. Magical, like a fairytale sprouting! I hope you have a wonderful trip! They are so alive --- but that is the magic of your images. Bravo!!! Delicate unfurling in Perselian style. Incredible. Like Dehl, I'm humbled. Very nice... I love the lighting here. An excellent b/w. This really works well in B&W. Cool treatment - they look alien!